CNN is the daily international news channel of choice for almost a third (30%) of Asia’s business leaders and is watched by more than half of them (52%) on at least a weekly basis, according to the latest data from the Ipsos Business Elite (BE) Asia Survey, released today. The survey examines the media consumption habits of senior business professionals across eight Asian markets. Each day 56% more Business Elites watch CNN than the next placed international news or business channel (BBC World News). Indeed, CNN reaches more Business Elites within a week than BBC World News reaches over the course of a month, while the network’s weekly audience is 62% greater than that of CNBC and Bloomberg TV combined. Business Elites are also more likely to rely on CNN than any other international brand* when online, as CNN.com enjoys the highest daily, weekly and monthly reach of any international web site**. The combination of CNN.com and CNNMoney.com gives 81% more weekly users than the next largest international site (BBC.com). “This survey firmly underlines CNN’s leadership as the number one source of international news for high end business decision-makers in Asia”, said Duncan Morris, Vice President Research, Turner International Asia Pacific. “Our substantial lead over other channels, both on TV and online, sends a hugely positive message to advertisers looking to connect with this valuable and hard-to-reach audience,” he added. “2011 has seen an extraordinary news cycle and I am delighted that our in-depth coverage, staying with the stories as they develop over many months, has continued to resonate so strongly with our viewers”, said Ellana Lee, VP and Managing Editor CNN Asia Pacific. “The fact that this key audience also ranked CNN as ‘The most important channel to watch for your job’ reconfirms our unique position in the way they consume news”, she added. 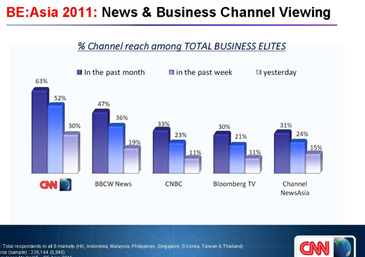 is a syndicated media survey among Asia’s business elite. It represents the views and behaviour of 238,000 of the most senior executives across 8 Asian markets (HK, Singapore, Taiwan, S.Korea, Indonesia, Malaysia, Thailand, Philippines). BE:Asia was conducted by Ipsos Media CT and is based on a sample of 6,846 respondents. BE:Asia 2011 results are taken from the combined 2010 and 2011 fieldwork periods.